Lie 1: "Oil exploration in Western Sahara is perfectly lawful"
The companies that are operating in Western Sahara under an oil exploration licence granted by the Moroccan government, will go out of their way to stress the legality of their activities. The Legal framework pertaining to Western Sahara is rather unique, and yet very straightforward. The United Nations still treat Western Sahara as a Non-Self Governing Territory; a territory that has yet to complete the process of decolonization. While other Non-Self Governing Territories have an administering power in place, as appointed by the United Nations, Western Sahara is the exception to that rule. The UN has not appointed an administering power to Western Sahara. Accordingly, Morocco’s status to the three-quarters of the territory that it has under military control, is not that of an administrator, but can only be regarded as that of an occupier. In addition, the sovereign right to determine the status of the territory and its possessions remains with its people; the Saharawi people, as the sole inhabitants of Western Sahara prior to Morocco‘s invasion in 1975. Just days before the invasion, the International Court of Justice had unambiguously declared that Morocco had no legitimate claims to sovereignty over Western Sahara and that the indigenous Saharawi people were to be granted their right to self-determination. That right has since been reaffirmed in hundreds of UN Resolutions. Recognizing the value of foreign economic investment in Non-Self Governing Territories as long as it is undertaken in collaboration with the people and in accordance with their wishes, the Opinion flew naturally from the paramount principle of self-determination. "The [UN Legal] Opinion, prepared at the request of the UN Security Council, views Morocco as the de facto administering power of Western Sahara.” - Kosmos Energy, Position Statement on Western Sahara, February 2014Oddly enough, the oil companies will refer to the UN Legal Opinion in defense of their operations in Western Sahara, even though none of them has ever bothered to make contact with the Saharawi people. Instead of seeking the consent of the Saharawis, they strike a deal with the Moroccan government, often calling it the de facto administering power in Western Sahara. Ironically, the UN Legal Opinion made it clear that Morocco is not the administering power in Western Sahara, but reviewed applicable international law by analogy. Because, the Legal Counsel argued, any possible limitation of the powers of such entity acting in good faith would certainly apply to an even greater degree to an entity that did not qualify as the administering power. The author of the UN Legal Opinion, Hans Corell, is adamant that the oil operations violate international law. "The latest development with respect to natural resources is a contract between Morocco and two companies, Kosmos and Glencore, relating to oil exploration and exploitation in the Cap Boujdour area off the coast of Western Sahara. I can see from the web that the two companies maintain that this contract is in conformity with my 2002 legal opinion. Regrettably, it is not. 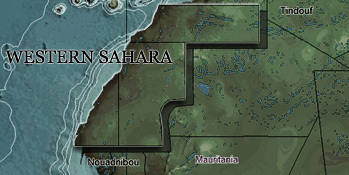 Already signing an agreement in which Morocco refers to Western Sahara as “the southern provinces of the Kingdom of Morocco” is at variance with Corporate Social Responsibility and the principles Protect, Respect and Remedy", Corell noted in the International Judicial Monitor of 23 February 2015. Not a single oil company has ever presented a shred of evidence or documentation as to how their operations in Western Sahara are in accordance with the wishes and the interests of the Saharawi people. All available facts point to the opposite conclusion. Crucially, all companies avoid the matter of self-determination altogether; whether the Saharawis want the oil exploration and potential subsequent development to even take place. When confronted with the flaws in their legal reasoning, companies will often try to postpone the problem. They will say that they are carrying out exploration work, and thus not physically removing any of the potentially available petroleum or gas. But if they were to proceed to development or exploitation, they would make sure they’d do so in line with international law. This is reflected in the Joint Declaration of Principles that Kosmos Energy, San Leon Energy and Total have signed with ONHYM, Morocco’s state-owned oil agency. These Declarations all state “that if any commercially viable deposits are discovered; including, among other things, that any such development would be undertaken in accordance with international standards, including those in the United Nations Charter, and those referred to in the 2002 United Nations Legal Opinion on resource development in Western Sahara”. However, as made perfectly clear by the UN Legal Opinion, international law applies doesn’t only apply to exploitation, but also to exploratory operations. Hence, the companies are already acting unlawful, as they failed to obtain the consent of the Saharawi people.